Pot Roast Stew "Under Pressure"
For this kind of recipe, I like to either use a slow cooker, or a pressure cooker (I'm a man of extremes). If you've never used a pressure cooker, it is a wonderful tool. We have several, and my favorite is an electric model (I got it at a thrift store). 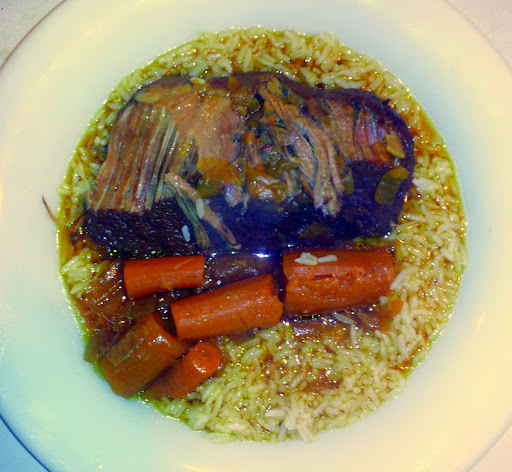 Mix the above thoroughly, and add a 3 lb pot roast to the bowl, covering all surfaces with the marinade/rub. Reserve the left over marinade and meat juices in the marinating bowl. Allow the roast to marinate in the fridge for as long as possible (this is usually about 5 minutes, as I'm hungry....3 or 4 hours is better). With the top off the pressure cooker, melt some butter, bacon fat, or olive oil in the bottom, and brown all sides of the roast. Have some water handy in case the honey starts to burn, and while browning the roast, chop 1 onion, peel and chop 4 carrots. Add them to the pot, and add water enough to submerge the onions and carrots...more if desired. A little wine will also help here (and it won't hurt the stew either). Add the reserved marinade and juices, and close up the pressure cooker. Cook for 1 hour after pressure is reached, and allow to cool. Serve with mashed potatoes, rice, or other starch. You can stretch this into a filling meal for several if you use a lot of water and serve in a bowl 3/4 full of rice.